Providing you the best range of high pressure air compressor for navy and special industries with effective & timely delivery. 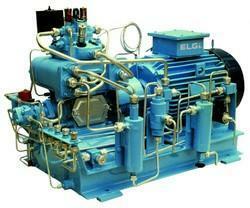 Elgi builds High-Pressure Air Compressor for NAVY & Special Industries; various applications like mining, diesel engine starting, hydel and concrete pumps. For your specific needs.